Pat Murdock, executive director of the Faith and Liberty Discovery Center, inside the gutted, pre-demolition space at the American Bible Society on the corner of Fifth and Market Streets (the Wells Fargo building), January 17, 2019. This is the area behind the large bible photos covering the windows along Market Street. Work has started on the $60 million religious-oriented attraction tracing the impact of the Bible on American life. One block from Independence Hall, where the Founding Fathers met to form a new nation, the American Bible Society is making a case for the Good Book’s place in American history. The messages in scripture about freedom, truth, and fairness were so ingrained in the culture of the new republic that Christian principles must have influenced the documents that form its foundation, the Bible society’s officials argue. For them, the Declaration of Independence, the Constitution, and the Bible are inextricably intertwined. The American Bible Society (ABS) will make that point in steel, glass, and wood in November 2020 when it opens its Faith and Liberty Discovery Center. 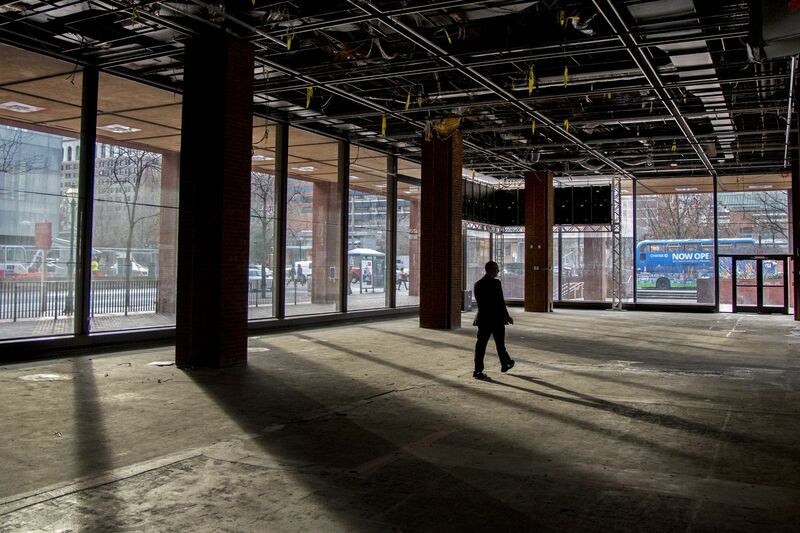 The $60 million center under construction at the corner of Fifth and Market Streets, will explore the role of faith and the Bible in American history, a new mission for the 202-year-old organization dedicated to increasing engagement with the Bible. “Our challenge is to create a center that will explore the relationship between faith and liberty in America from its founding to today by illuminating the influence of scripture on individuals,” said Patrick Murdock, the initiative’s managing director. Pat Murdock, executive director of the Faith and Liberty Discovery Center, in the offices of the American Bible Society. Work has started on the $60 million attraction tracing the impact of the Bible on American life. But not all scholars agree about the impact of religious belief on the nation’s founding. The 40,000-square-foot center will occupy the first floor of the Wells Fargo Building across the street from the National Museum of American Jewish History. In 2015, ABS moved its headquarters from New York to the building’s eighth and ninth floors, where visitors are greeted with a wall decorated with quotes from the Bible. Downstairs, the Faith and Liberty Discovery Center will house galleries, a 3D theater, and an education center for an expected 250,000 annual visitors. The center’s 75-minute immersive experience will explore themes including faith, unity, hope, liberty, and justice. It is being financed by the ABS and private donations. Exhibits will examine the role that faith played in the lives of pivotal figures such as the Rev. Dr. Martin Luther King Jr., Dorothy Day, and William Penn. Visitors will be given a hand-held baton (called a lamp) that will help them interact with exhibits. The digital record of their visit will be used to create personal websites reflecting their interests and to suggest purchases at the gift store. Local Projects, a firm that spearheaded the 9/11 Memorial Museum in New York, is overseeing the center’s exhibits and visitor experience. Building design is by JacobsWyper Architects. A rendering of exhibit space inside the future Faith and Liberty Discovery Center. The project is just one that ABS is embarking on as it settles in its new home. Officials are developing a Faith and Liberty Heritage Trail that will take visitors on a self-guided walking tour of Philadelphia’s religious history, including two congregations whose roots date to the 1700s: Mikveh Israel, the first Jewish congregation in Philadelphia and second oldest in the nation, and Mother Bethel African Methodist Episcopal (A.M.E) Church, the denomination’s founding congregation. Officials also have commissioned playwright Christopher Smith to develop a musical about the role that faith played in William Penn’s life. Smith, a former Bucks County police officer, wrote the score for Amazing Grace, a musical that ran on Broadway for three months in 2015. The show was based on the life of John Newton, a slave trader who experienced a crisis of conscience and became an Episcopal priest and abolitionist. The human failings of people of faith will also be explored in the center, Murdock said, recognizing that the Bible has been used as a tool to enslave and oppress people and justify discrimination. “You have to be honest and historically accurate or else people will write it off as ‘just another Christian thing,’ ” Murdock said. The Founding Fathers and the framers of the Constitution were steeped in religious culture and values, although some did not practice orthodox Christianity, noted David Mark, a political scientist at Villanova University. They realized that preserving the republic required its citizens to be law-abiding, honest, and civic-minded, and the primary transmission of those values, he said, is religion. John Jay, a devoted Anglican who served as the first chief justice of the United States, was also a president of the American Bible Society. But Benjamin Franklin was a deist, who believed in a supreme being, but one who does not interfere in the universe. A video monitor showing renderings of the Faith and Liberty Discovery Center is reflected in the window of a conference room overlooking Independence Hall (rear) inside the offices of the American Bible Society. Work has started on the $60 million attraction tracing the impact of the Bible on American life. Hamilton, the Penn scholar, argues that any implication that the Bible served as an influential source of the principles in the Declaration of Independence and the Constitution is incorrect. “The one time religion is mentioned in the Constitution is to forbid elected officials from having to pledge allegiance to any one faith or a faith at all,” she said. The religious views of the Founding Fathers included “deists who didn’t believe in Jesus Christ,” Hamilton said. "It’s not that there weren’t Christians at the founding, but there was diversity.” Any attempt to “own American heritage through one’s religious faith is not helpful,” she said, suggesting that the center may be more concerned with proselytizing than historical accuracy. Murdock said they are not trying to convert visitors, but neither are they hiding their views. Gretchen Buggeln, author of Religion in Museums, takes the middle road when considering museums devoted to religious groups. The future site of the Faith and Liberty Discovery Center, on the first floor of the American Bible Society offices (the Wells Fargo building) on the corner of Fifth and Market Streets.